Click https://g.co/csfirst/discovery to watch a short video about coding and complete a coding activity. Check out the Learning Commons! 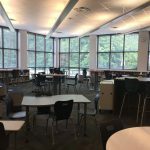 During the 2016-17 school year, with your support, the HTMS Foundation funded the conversion of the HTMS media center to a learning commons atmosphere! We have new carpet, new electrical under the carpet, and new furniture! The students absolutely love the new look which includes rolling desks, buoys, and large project tables! Thank you Hightower Trail Husky Foundation!